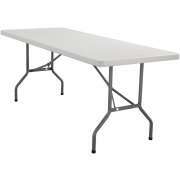 Hertz Furniture has a wide range banquet tables for every occasion. 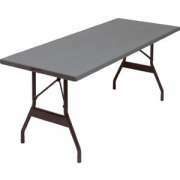 Our folding tables are durable and budget-friendly. 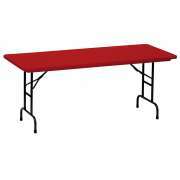 They are easy to set up and put away, making them an excellent banquet table choice. They can also serve a number of other useful purposes. 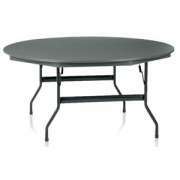 What folding table shape is the best? 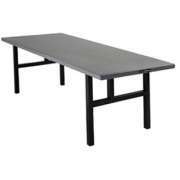 With a huge selection of banquet tables, you can find the perfect quantity and configuration for your space. 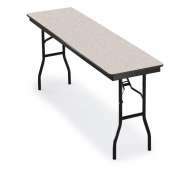 Lightweight folding tables are an optimal choice for their no-hassle transport and versatility. 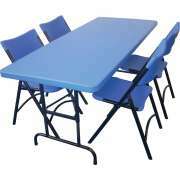 With such a wide variety of foldable tables to choose from you&apos;ll find the right choice for any setting. Which tabletop material is the strongest? 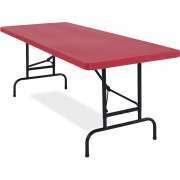 If you are looking for the ultimate in toughness and strength, blow-molded plastic tables are the way to go. 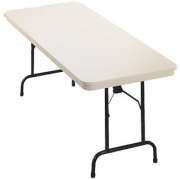 Blow molded folding tables have an unbelievable weight capacity, so you can put your heaviest turkey or largest wedding cake on them with no concerns of overburdening. They are super resistant to scratches and stains and even harsh chemicals or paints wipe clean with the use of a strong solvent. 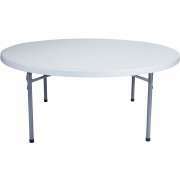 Blow molded plastic tables are available in a choice of vibrant colors. A selection of tabletop materials enables you to find the option that fulfills for your needs. Whether you prefer plywood, laminate or aluminum, you are sure to find what you are looking for. Laminate is easy to clean and resistant to most light scratches, dents and stains. Aluminum is super sturdy and lightweight. Plywood is strong and stable. 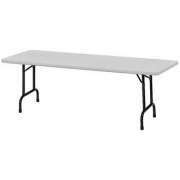 What banquet table shape will fit in my room? Banquet tables come in a selection of shapes and sizes, so you can choose the perfect style or combination of styles for your hall. Rectangular folding tables create an elegant atmosphere when they are decked out in your banquet finest. 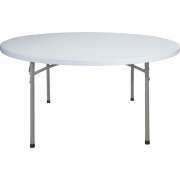 Round folding tables create a more friendly and intimate atmosphere. A circle enables all people seated at the table to carry on a group conversation with easy viewing and hearing. This is a great configuration for tables of long-time colleagues and benefactors, or even first introductions. Which folding table legs are the strongest? Another important factor in the selection process is the matter of supports. Fold up table legs come in a choice of styles, each of which has its own advantages. Wishbone legs are super sturdy and very easy to fold and unfold. T legs are quite stable as well. If you are worried about knocking knees, classic four-legged tables are a great option because they leave open leg room on all sides. Cantilever legs are optimal for a head table or conference, where participants or honorees are seated facing only one direction, because they maximize leg room on one side of the table. Worried about matching the heights of your folding table and chairs? 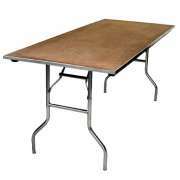 Be sure to check the dimensions of the tables you order to verify that your tables and chairs are properly proportioned. Appropriately-sized tables and chairs will keep guests, attendants and honorees comfortable so they won&apos;t mind sitting through a few extra speeches or toasts. If you are not sure what your preferred chair height is, or you own chairs in a number of heights, adjustable-height tables are the way to go. 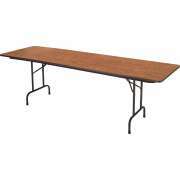 With adjustable banquet tables, you will never have to worry about whether your tables and chairs are proportionate. Additionally, if you decide to purchase new seating at a later date, you won&apos;t have to buy an entirely new set of tables. 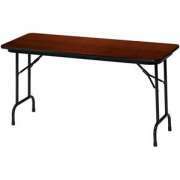 Instead, you can enjoy appropriately-sized tables in a matter of minutes. Which tables will make my room look nice? Want to create a more original coffee shop style atmosphere in your banquet hall? Counter-height tables will look great with some sleek bar stools. They are a great choice for a creative fundraiser or special event where you are looking for a way to give your room a whole new look without undertaking any major renovations. Whether you just need a few extra tables for your banquet hall or you are looking for an entirely new configuration, Hertz Furniture has the selection you need to make the best choice. 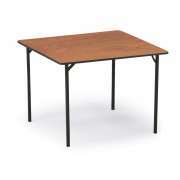 We offer many models from leading manufacturers including National Public Seating, Correll, Allied Plastics and more. Overwhelmed by all of the options? Let our design team help you determine the optimal layout, configuration and quantity to fulfill your needs - and then some.